Herring Gull (argentatus) KV48 1CY-10CY, 2006-2015, Oostende (Belgium), Boulogne/Mer (NW France) & Terschelling (Netherlands). 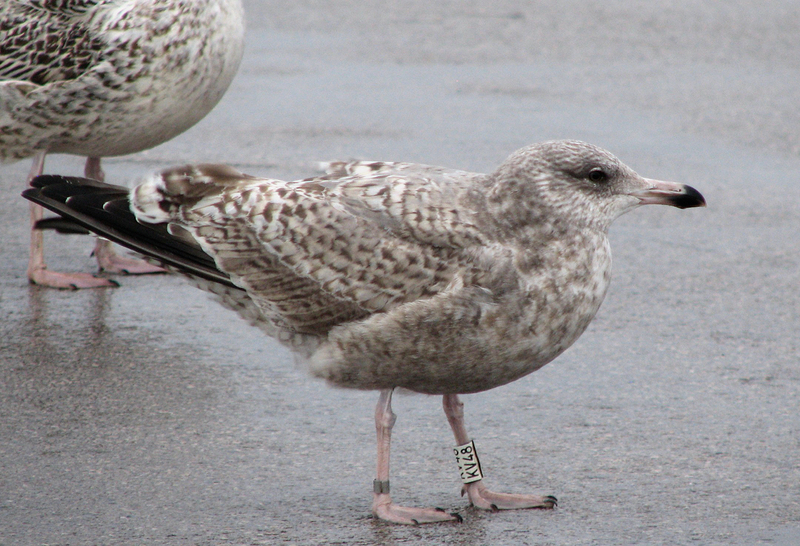 1cy argentatus, ringed as pullus in Kandalakshskiy Reserve, Murmansk, N Russia (67.05 N, 32.29 E). RINGING PLACE Kandalakshskiy Nature Reserve, Severnoe lesnichestvo, isl. Below: Herring Gull (argentatus) KV48 1cy, November 26 2006, Oostende, Belgium. The partial autumn moult in argenteus (moult from juvenile plumage into so-called "first winter" plumage) includes the body and head feathers. 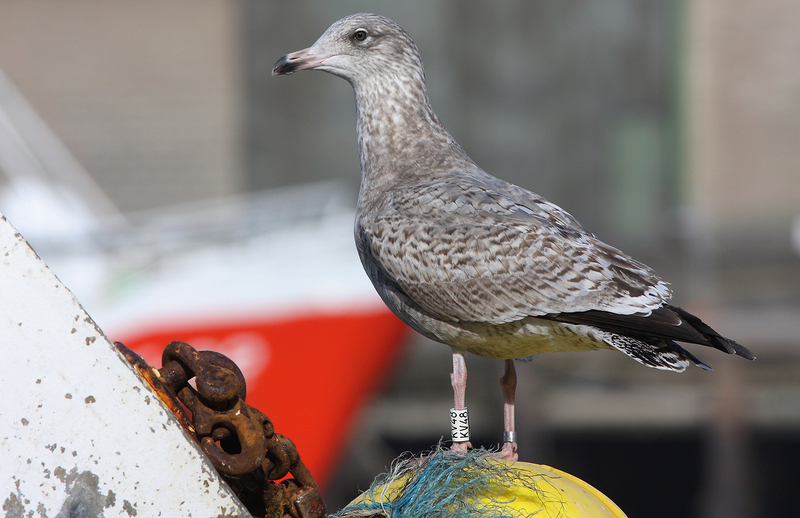 This moult starts as soon as the nest is abandoned (late June) and continues until January. In general, the head turns paler on throat and forehead. The breast will turn paler as well. 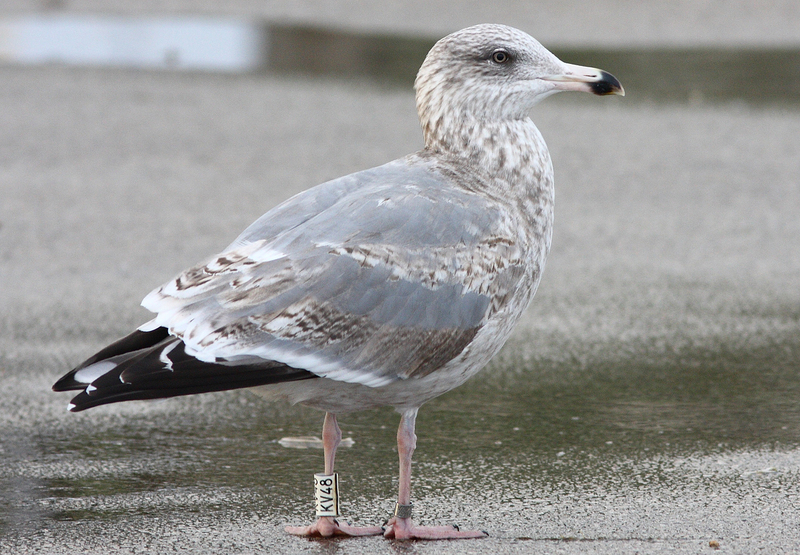 The feathers on belly and vent will still be juvenile in most 1cy argenteus by November. From July onwards, the mantle and upper scapulars are moulted to second generation feathers, showing an anchor pattern and a dark base. The lowest row of scapulars are still juvenile by March in most 2cy birds (contra e.g. michahellis). The notched pattern of the juvenile scapulars is repeated on the juvenile lesser, lower lesser and median coverts, although the medians have paler centres. 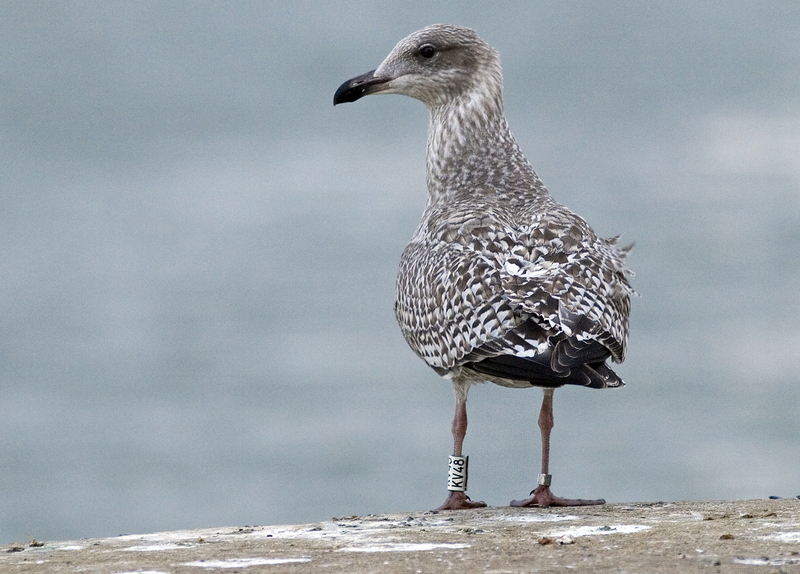 The juvenile greater coverts show a 'piano-key' pattern; on the outer greater coverts as well. The tertials have an obvious notched pale fringe and transversal bar. The juvenile wing-coverts, rectrices and remiges start to bleach and show wear in the fringes from September onwards. 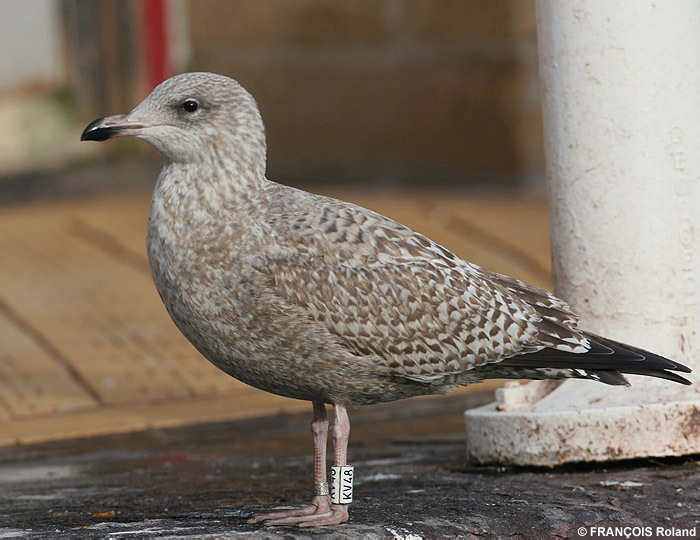 The secondaries, primaries and primary coverts are dark with a small white tip, but the juvenile inner primaries show an obvious pale window, prominent from below and above. The under-wing is rather uniform grey-brown patterned. The tail has a broad sub-terminal band and isolated dark bars on the basal half. The iris is dark, the bill is blackish, sometimes with a paler base, and the legs are flesh-pink. 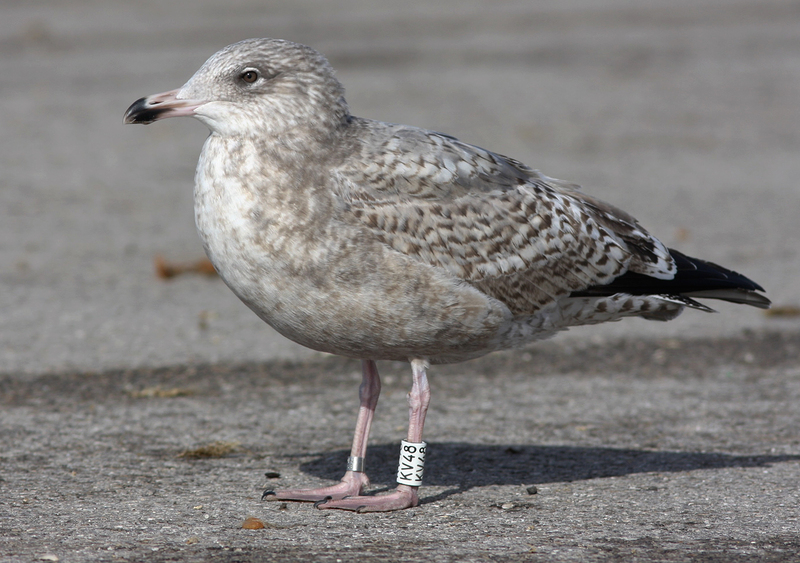 Below: Herring Gull KV48 1cy (argentatus), December 31 2006, Oostende, Belgium (picture F. Roland). 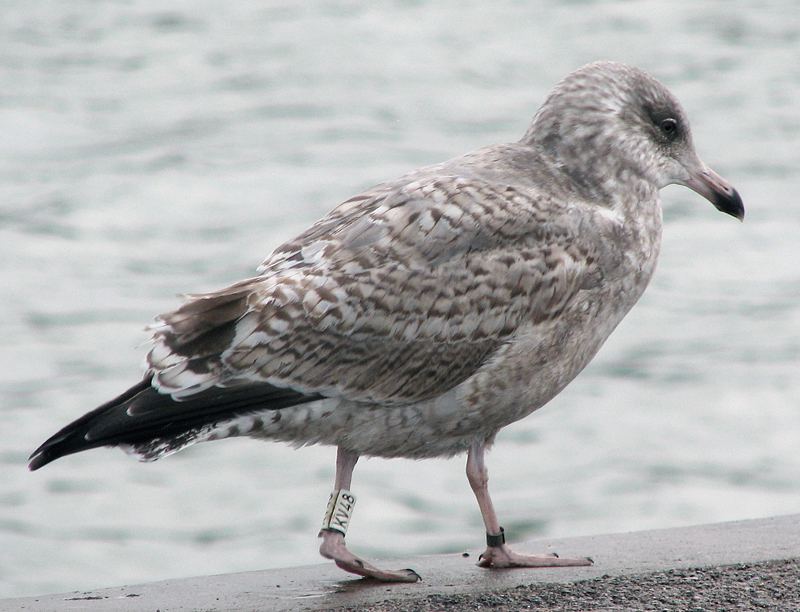 Below: Herring Gull KV48 3cy (argentatus), January 15 2008, Boulogne, NW France (picture J.M. Sauvage). 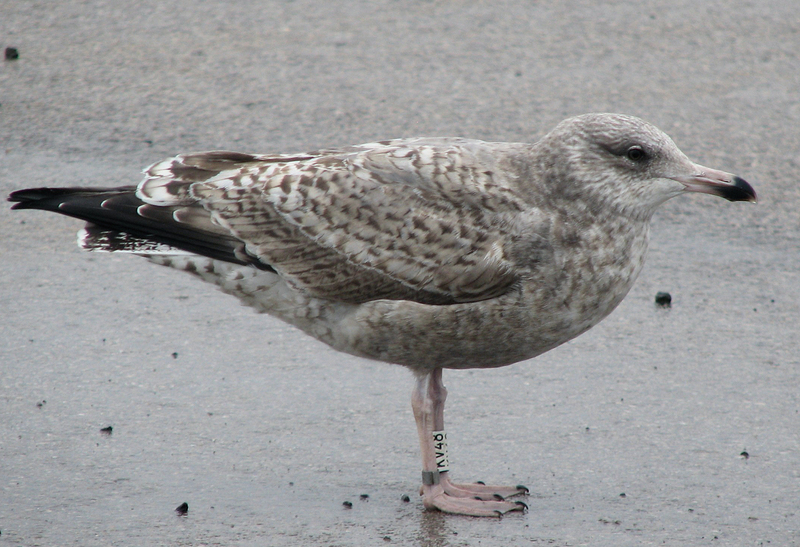 Below: Herring Gull KV48 3cy (argentatus), February 26 2008, Boulogne, NW France (picture J.M. Sauvage). 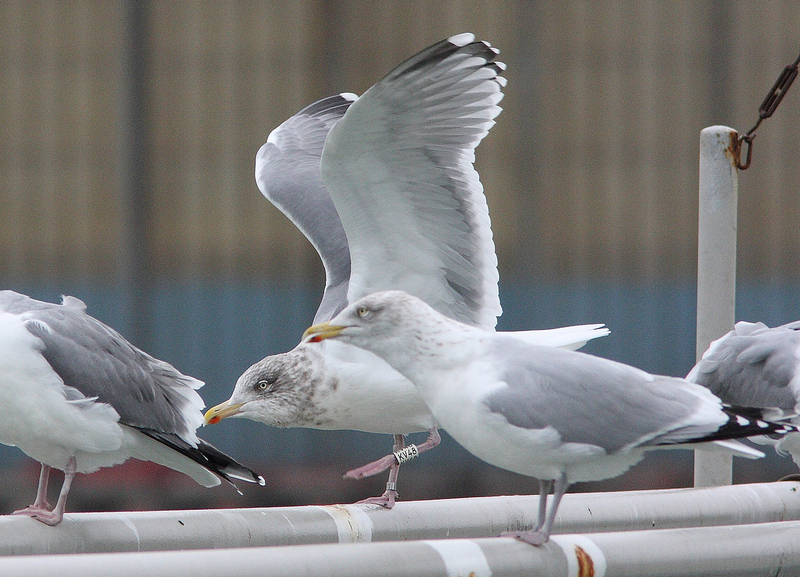 Below: Herring Gull KV48 3cy (argentatus), March 03 2008, Boulogne, NW France (picture J.M. Sauvage). 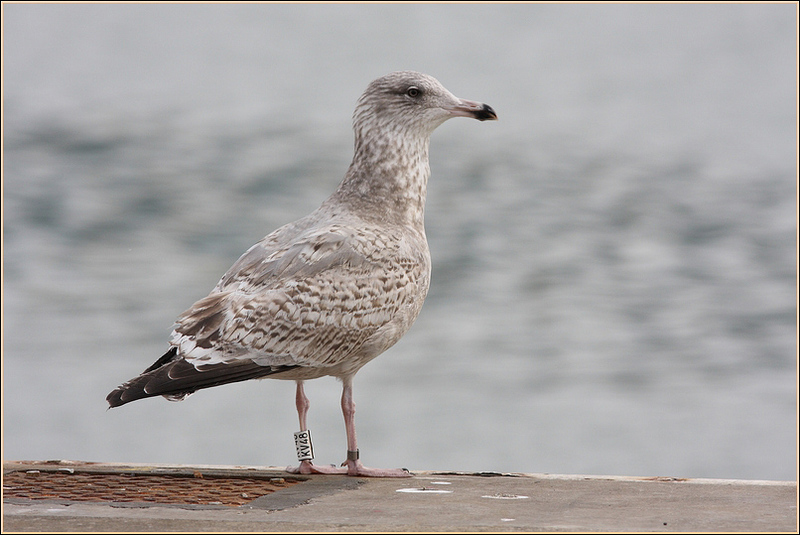 Below: Herring Gull KV48 3cy (argentatus), March 07 2008, Boulogne, NW France (picture J.M. Sauvage). 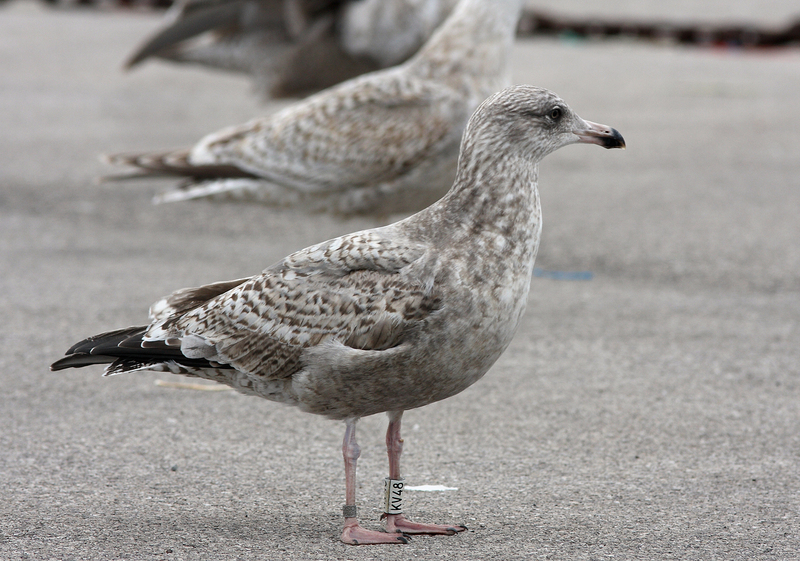 Below: Herring Gull KV48 3cy (argentatus), March 08 2008, Boulogne, NW France (picture J.M. Sauvage). 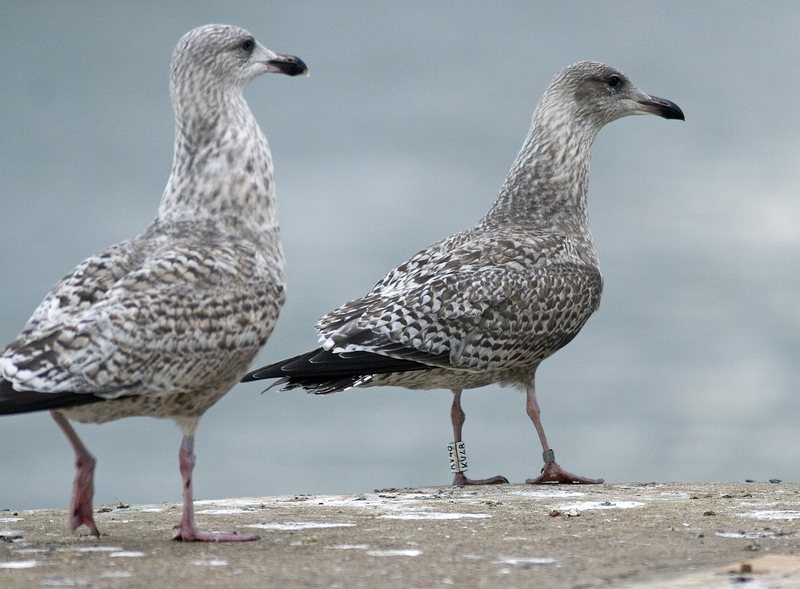 Below: Herring Gull KV48 3cy (argentatus), March 25 2008, Boulogne, NW France (picture J.M. Sauvage). 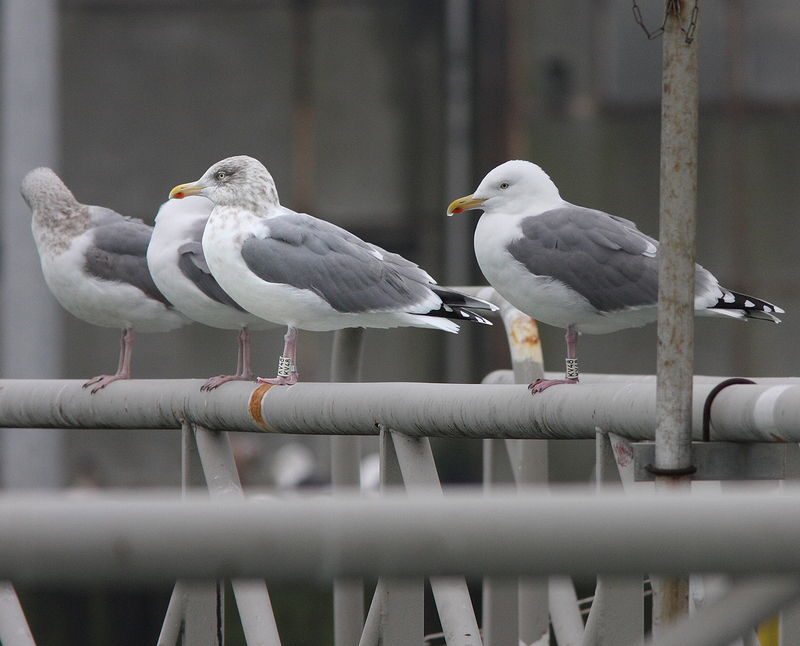 Below: Herring Gull KV48 3cy (argentatus), December 05 2008, Boulogne, NW France (picture J.M. Sauvage). P9 fully grown. Adult-like pattern on secondaries. 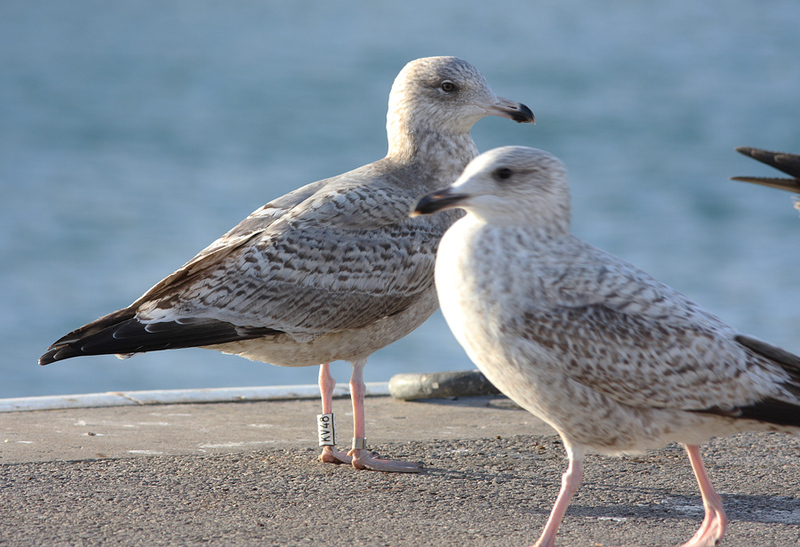 Below: Herring Gull KV488cy (argentatus), January 11 & February 11 2013, Boulogne, NW France (picture J.M. Sauvage). Composed image to show KV48 changing the head pattern within just a month: left streaked head on January 11 and right clean white head on February 11 2013. 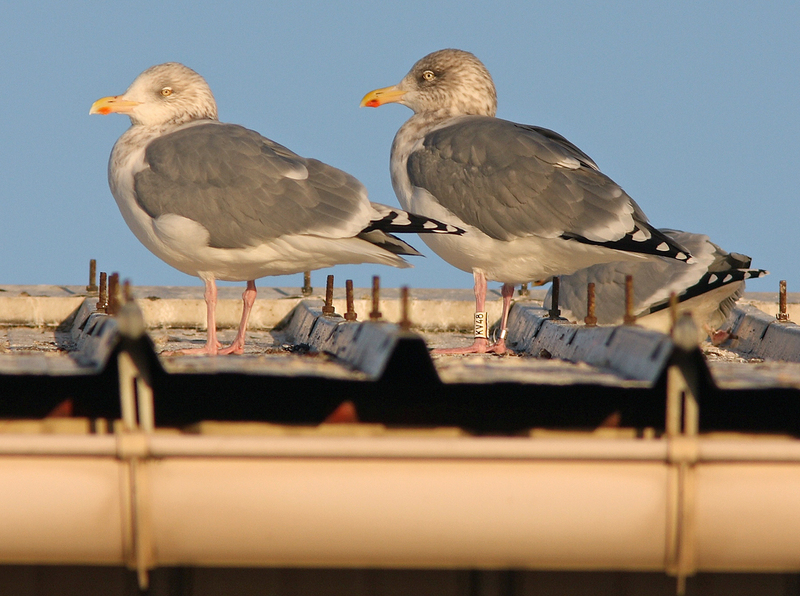 Below: Herring Gull (argentatus) KV48 8cy, December 14 2013, Boulogne, NW France (picture J.M. Sauvage). 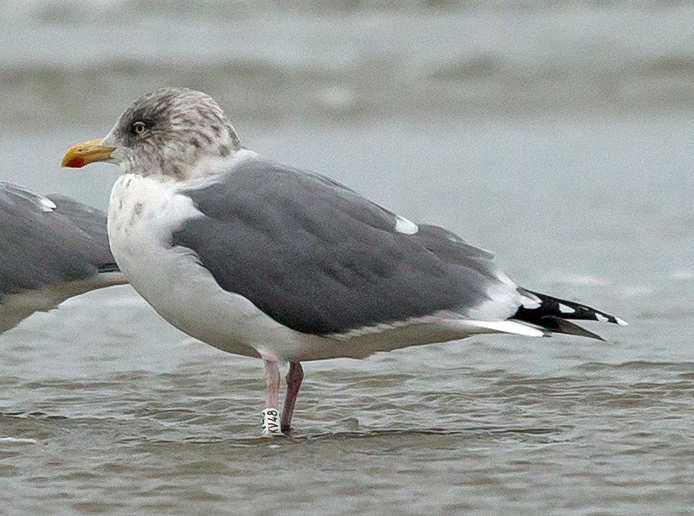 Below: Herring Gull (argentatus) KV48 8cy, December 27 2015, Terschelling beach, the Netherlands. Picture: Jacob-Jan de Vries. Really dark grey on upperparts.